Cystoid macular edema (CME) is a primary cause of postoperative reduced vision. It may occur even when the intraoperative course is successful for operations such as cataract and vitreoretinal surgery. Its incidence following modern cataract surgery is 0.1%-2.35%. This risk is increased if there are certain preexisting systemic or ocular conditions and when there are intraoperative complications. The etiology of CME is not completely understood. Prolapsed or incarcerated vitreous and postoperative inflammatory processes have been proposed as causative agents. Pseudophakic CME is characterized by poor postoperative visual acuity. 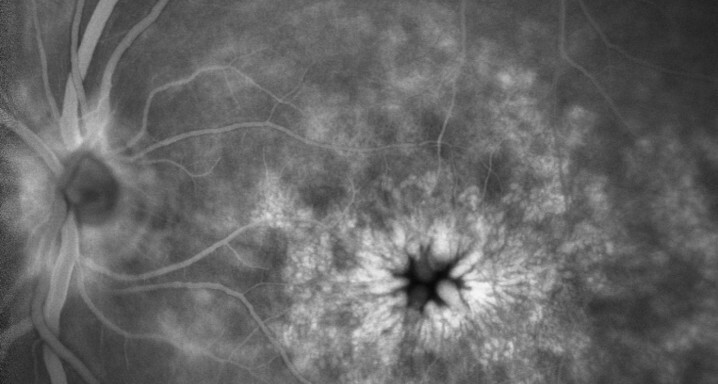 Fluorescein angiography is indispensable in the workup of CME, showing the classical perifoveal petaloid staining pattern and late leakage of the optic disk. Optical coherence tomography is a useful diagnostic tool, which displays cystic spaces in the outer nuclear layer. The most important differential diagnoses include age-related macular degeneration and other causes of CME such as diabetic macular edema. Most cases of pseudophakic CME resolve spontaneously. The value of prophylactic treatment is doubtful. First-line treatment of postsurgical CME should include topical nonsteroidal anti-inflammatory drugs and corticosteroids. Oral carbonic anhydrase inhibitors can be considered complementary. In cases of resistant CME, periocular or intraocular corticosteroids present an option. Antiangiogenic agents, though experimental, should be considered for nonresponsive persistent CME. Surgical options should be reserved for special indications.